When you have logged onto the website, the drop down menu under your user name will allow you to select the option 'Manage Opportunities'. Selecting this will give you access to your dashboard. Clicking the 'New Opportunity' button will allow you to create a new volunteering opportunity. This is the 'New Opportunity' window, where you can fill in details about the opportunity. These details are important to both students that will apply for the position and staff that will review the opportunity. You can save the opportunity as a 'Draft' and you can come back at a later date and edit it. Once the opportunity has been created you will recieve an email and your opportunity will be reviewed by an admin. When your opportunity has been reviewed you will recieve an email if it is Successful/Unsuccessful. Successful opportunities are available for students to apply to. If your opportunity is unsuccessful an administrator will contact you. Show Opportunity; this shows the details of the opportunity you entered. Edit Opportunity; allows you to edit some aspects of the opportunity. If your opportunity is still a draft then you can edit all aspects of the opportunity. Volunteering Application; shows all students that have applied for your opportunity. When a user applies to your opportunity you will recieve an email, to review the candidate you will need to check their details through your dashboard. The applications tab will allow you to see users who have applied for the opportunities you have on offer. You can accept the user using the setting icon; you can also view their profile. When you have approved the student for the opportunity you will need to contact regarding the opportunity and the next steps for them to take. The student also receives an email regarding the approval of the opportunity. They are told to wait until the organisation talks to them. 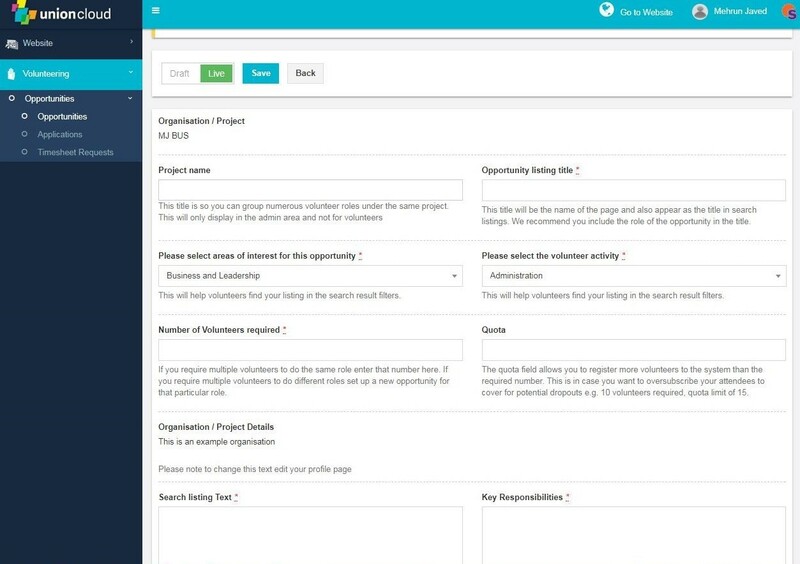 To contact the approved volunteer you will need to get their contact details from their profile within the applications tab on your UBU dashboard.